Tulikivi won a Vesta Award for its Harmaja (har-my-ah) soapstone fireplace in the Wood Products category at the 12th Annual Vesta Awards Ceremony, held recently, at the Hearth, Patio & Barbecue Expo in Atlanta, Georgia. The Harmaja is perfect for areas that homeowners would like to warm up very quickly, while also enjoying a comfortable heat for up to 16 hours, so customers will always wake up warm, adds Johnson. The Vesta Awards were created by Hearth & Home magazine to recognize and honor companies for their innovation in product design and/or technology. Judging teams are made up of retailers, distributors, product designers and other industry experts. This is the second year in a row that Tulikivi was honored at the Vesta Awards, having been a finalist in the same category in 2011. “This is a real innovation in heating technology, combining convection with radiant heat,” said Jeremy Johnson, Tulikivi’s marketing and sales manager for North America. “The Harmaja provides the quick-release heat of a wood stove, with the warmth and long-lasting radiant heat storage only a masonry heater can provide. 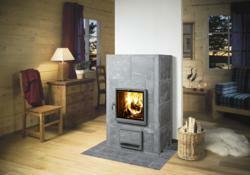 Its ease of setup and attractive price point make the Tulikivi Harmaja a quality multifaceted addition to our distributor and dealers showrooms and gives them the option to offer this masonry heater as an alternative to conventional wood stoves.” As an added benefit, the unit is also eco-friendly. Coals burn hot and complete, ensuring low emissions. “The Harmaja is perfect for areas that homeowners would like to warm up very quickly, while also enjoying a comfortable heat for up to 16 hours, so customers will always wake up warm,” adds Johnson. The Harmaja functions as a versatile stove and oven, too. Its unique cooking rack lets consumers take advantage of high heat to flame broil favorites, while they can utilize its thermal heat for slow roasting meats, vegetables and stews. The Harmaja supports Tulikivi’s reputation for elegance, sustainability and unparalleled quality in design and materials. As is standard, the Harmaja unit is made of hand-cut Finnish soapstone, features durable doors and finishes, and comes with a five-year warranty. It is available to dealers in the United States and Canada for the first time. For the nearest distributor, visit tulikivi.com or call 800-843-3473.